Thessalonika and her mom woke up early,they would pray and work on Bible studies, then work out at a local fitness center before starting their hour-and-a-half commute from their home at the Great Lakes Naval Station near North Chicago to Chicago State, located on the city’s South Side. During the commute, Wonder and Thessalonika study theory together and chat about their homework assignments. Thessalonika said her mother keeps her motivated. “My mother is a strong inspiration to my success. She is a veteran of the United States Navy, and when she finished her tour, she home-schooled my brother and I,” Thessalonika said. “The parents are the most influential force in their own children’s lives, and they have the power to influence them to do good and to go forward,” Wonder Embry said. Thessalonika was home-schooled until she was 8. At age 11, after receiving the equivalent of a high school diploma through her home schooling, she passed an entrance exam to attend College of Lake County and enrolled to study psychology. She said she chose college from such a young age because she loves studying and has an interest in psychology that goes far beyond just material knowledge. One of her ultimate goals is to help people through a clinic she hopes to establish with her mother and her brother, Jeremy. If that weren’t impressive enough, the 14-year-old carries a 3.9 GPA and is a member of the school’s Honors College, a program designed for talented and highly motivated students. And she serves as a student senator. Thessalonika plans to continue her studies at a graduate program for clinical psychology at Rosalind Franklin University of Medicine and Science, a private college in North Chicago, or Stanford University. While college can be difficult for any student, and especially one who’s barely into her teens, Thessalonika credits much of her success to the strong support her family provides. 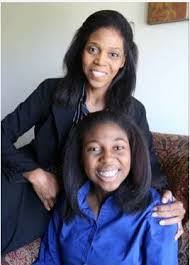 *Wonder Embry and her daughter Thessalonika are a true inspiration to me and have motivated me to do more to influence the youth to strive for excellence!! Posted in Saving The Youth Stars™Tagged Abundance, africa, African, black, Black Family, Black Girl, Black Girls Rock, dictionary, dreams, Education, Gifted, goals, growth, happiness, happy, health, Home school, inspirational, inspire, Intelligent, joy, knowledge, learn, parents, positive, Proverb, sista, Smart, success, teach, teen, teens, Thessalonika Arzu-Embry, unity, wealth, wisdom, wise, youthBookmark the permalink.